This article discusses a little known 19th century legal institution: The New South Wales Court of Claims. Established in 1833, its remit was to determine who had the better or best title to land in situations where informal land practices had led to uncertain or conflicting claims to land. Despite its important position within the framework of early land law, its operation has been overshadowed by later land institutions, such as the Torrens system. An examination of this court, however, has two benefits. Most obviously, it can shed light on how the mass of informal and conflicting titles was resolved in New South Wales. More broadly, an examination of the court’s practice reminds us that the connections between colonial institutions cannot be determined from their enacting statutes, but rather must be disinterred from their day to day workings. This article considers three recent Australian judicial developments in real property law that remind us just how frail, or lacking in durability, that title may be. In Payne v Dwyer the Supreme Court of Western Australia dealt with the operation of adverse possession to determine whether a co-owner might adversely possess another co-owner in a situation where the co-ownership of the mineral rights was found in a separate title to the land on which the minerals were found. In Willmott Growers Group Inc v Willmott Forests Ltd (Receivers and Managers Appointed) (in liq), the High Court held that the power of liquidators to disclaim leases would extinguish tenants’ proprietary rights; and in Castle Constructions Pty Ltd v Sahab Holdings Pty Ltd, it held that an easement deliberately deleted, even wrongfully, from a Torrens land title register could not be ordered to be reinstated because such a deletion does not constitute an “omission” within the statutory exception to indefeasibility. Meetings of the governing bodies of multi-owned developments are no place for an owner’s lawyer to put their client’s case; even with the governing bodies’ own lawyers present. However careful and considered the advocacy may be, an owners’ meeting is not a courtroom. There are clear ethical hazards for the would-be advocate which, at least in the author’s view, should temper the enthusiasm of even the most enthusiastic legal practitioners. Using a real-life scenario in Queensland, Australia, this note highlights those ethical hazards and how they can be avoided. This note examines the role that property law can play in the regulation and understanding of digital assets. Undoubtedly these will attract an economic value, but does this economic value translate into a notion that a person’s digital estate is personal property which can be owned, possessed, transferred or bequeathed? In Fairstar Heavy Transport NV v Adkins  EWHC 2952, English courts were asked to consider the status of emails and whether these were property to which someone could make a possessory or title based claim. Ultimately the superior court was not required to address this, instead relying on the more traditional ground of agency. However, what we do know is that the dispute will not die, unlike the person who to some degree controls or creates these digital assets. The conclusion is that the phrase “digital property” is not an oxymoron and that the private law domain of property will have a role to play. It remains unclear what that role will be. The Unit Titles Act 2010 (NZ) represents one of New Zealand’s most recent statutory reforms in the area of property law. This brief note outlines some key issues and difficulties arising from the legislation, and canvasses significant case law that has arisen. The note concludes by identifying that further reform is necessary in order to remedy the main difficulties in the Act. This update on Singapore law addresses three broad developments. First, two decisions considering the underlying nature of an award of damages under the “user principle” as a matter of Singapore law are examined and compared. Second, the principal changes effected by a recent amendment to the Singapore Land Titles Act are considered. Finally, a number of case law developments relating to the closely linked subjects of resulting trust, constructive trust and proprietary estoppel are also surveyed. The Mineral and Petroleum Resources Development Act 28 of 2002 (ZA) (MPRDA) makes provision for the conversion of so-called “old order” rights to prospecting and mining rights. 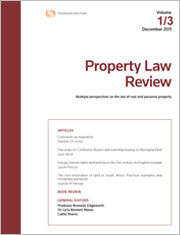 The consequences of the failure of holders of old order rights to apply for (a) conversion or (b) new rights under different circumstances were decided by the South African Constitutional Court in two decisions during 2013. These cases are discussed against the background of the nature, content and termination of old order rights. It is also discussed whether such rights were expropriated by the MPRDA and, if so, whether compensation is payable by the state. Reviewing recent decisions concerning successive vexatious caveats, the author argues that the Real Property Act 1900 (NSW) allows, and indeed may even mandate, the Registrar-General to do more than simply leave the hapless harassed caveatee to rely on statutory procedures under Pt 7A of the Act to protect him or herself and obtain compensation. Isn’t prevention better than cure? The Queensland Property Law Review is currently reviewing seller disclosure laws in Queensland. The review will consider if the desire to provide consumers of real estate with valuable timely information about a property offered for sale can be effectively delivered with a minimum of red tape. This note examines the principles proposed by the first discussion paper on seller disclosure and their likely effect in practice. For the pdf version of the table of contents, click here: WAU – Prop L Rev Vol 4 Pt 1 Contents.